I was once told a story that when VMware wanted to P2V so many thousand systems, they went to PlateSpin for help. PlateSpin Migrate delivers the fastest and most efficient anywhere-to-anywhere migrations, using proprietary block-based transfer protocols and Server Sync technology. System Requirements: Windows Server 2003 (.NET 3.5 SP1 & IIS 6 or higher) or Windows Server 2008 (.NET 3.5 SP1), 1 GHz CPU, 2 GB RAM, 10 GB disk, MSSQL 2005 Express or existing local or remote MSSQL 2005. Q: How long does a typical migration job take to complete? A: The timing of workload migrations with PlateSpin Migrate can vary depending on several external factors such as network availability and the size of the workload. However PlateSpin Migrate has been specifically engineered to be the most robust migration tool on the market in terms of speed and scalability. Q: Does PlateSpin Migrate support multi-pathing? Q: Does PlateSpin Migrate support NIC teaming? A: Yes, PlateSpin Migrate supports NIC teaming for source Windows workloads, but the NICs will not be teamed on the target side. Q: Does PlateSpin Migrate support Windows Clusters? A: Yes, PlateSpin Migrate is the only workload migration product on the market to support migration of Windows clusters in a non-disruptive manner. Q: … I want to perform an offline migration from a remote location)? A: A user should be able to boot the source with the ISO remotely via PXE. Along those same lines, if the issue is the lack of a physical optical drive, we have a process to create a bootable USB thumb drive as well. 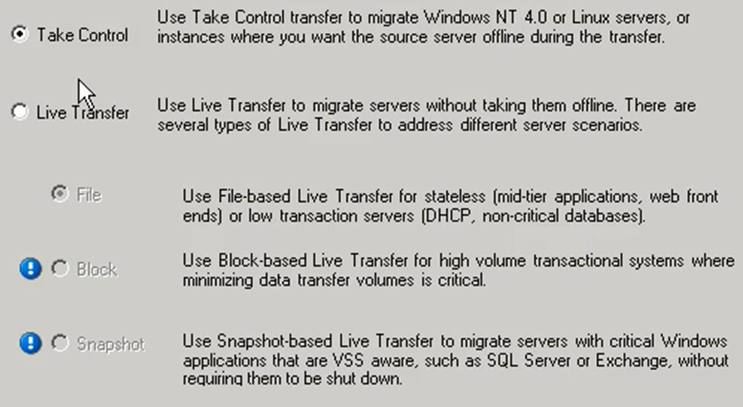 Live Transfer: Is supported by Windows 2000 and above. > File: Use for low transactional servers, like webservers and fileservers, not recommended for database or highly transaction servers. > Block: Can be used for database servers and highly transactional servers. 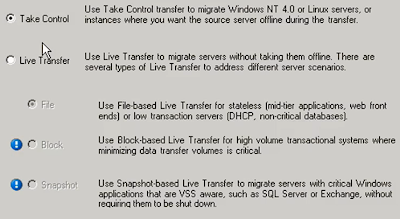 > Snapshot: Windows 2003 and above, it is a file based transfer option, but can take advantage of VSS which allows Migrate to copy SQL databases and Exchange databases without needing to stop the services. "PlateSpin Migrate licenses are sold on a per-workload basis (doesn't matter how many PlateSpin Migrate servers you have.) A license entitles you to an unlimited number of migrations on a specific number of workloads. 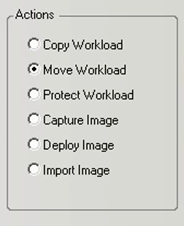 With every migration, a workload unit of the license is assigned to either the source or target. The machine that has the workload unit assigned to it can subsequently be migrated an unlimited number of times. Each time a workload is assigned, the Workloads remaining number is decreased."